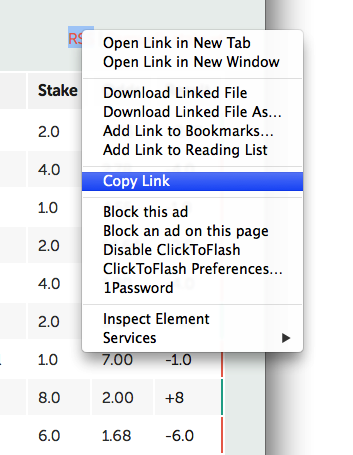 You can follow a user's bets via RSS by clicking the RSS link on the users page. Following a user's bets means you can use an RSS reader to see the information about each bets being registered without actually accessing the site. RSS is a protocol that notifies you every time a page is updated and there’s a number of way you can use it. Depending on your computer and preferences you can either click the link and select what program you want to use for the subscription – this could be your web browser or a standalone RSS reader. Often this is done automatically. For example, Firefox let’s you subscribe right in the browser. You can also right-click and copy the link and paste in in to your favorite program. 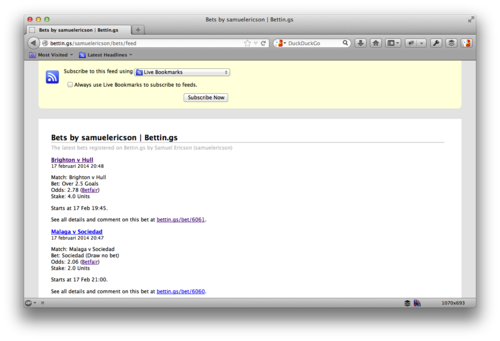 The link should look something like this: http://bettin.gs/samuelericson/bets/feed.